Download The Boss Baby in Digital HD from the iTunes store. The Boss Baby images are © DreamWorks Animation. All Rights Reserved. "Kind of disjointed," whispered one correspondent. "Distracting…," murmured another. Yet, they all boisterously agreed loudly that they found themselves laughing...increasingly. "It was very funny," many, if not all, declared. Wherever the disconnect might be, this film is truly funny, inventive, and relatable. Inspired by the 2010 best-seller by Marla Frazee, The Boss Baby, DreamWorks Animation's family comedy expands on the original 30-page picture book by introducing an older brother. The premise is at once ludicrous, elaborate and flimsy. That is precisely why it works. Boss Baby is fittingly voiced by Alec Baldwin (30 Rock, Mission: Impossible Rogue Nation). 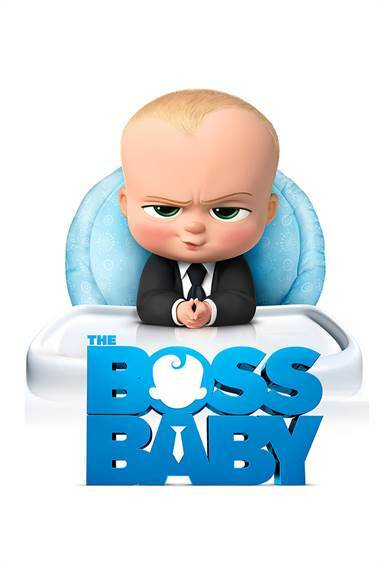 While some aspects of Boss Baby could have been influenced by Baldwin's 30 Rock character, Jack, any semblance to his portrayal of that petulant man-child on Saturday Night Live is purely coincidental as production was well underway (if not, mostly completed) by the time that that iconic portrayal would come to be. It does appear to be a type that Baldwin exceeds at capturing. In this case, it is witty, charming, and refreshingly child-friendly. As anyone might guess, Boss Baby arrives to wreak havoc on his new family. In this case, however, the impact is seen through the eyes of Tim (voiced by animation heir Miles Bakshi, grandson of Ralph Bakshi most famous for Fritz the Cat and Mighty Mouse; and, Toby Maguire as the reflective adult narrator). Tim's fantastic 7-year-old imagination plays out the arrival of a baby sibling as an outrageously devious plot meant to undermine and disrupt all that Tim knows to be of this world. Director Tom McGrath blends 2D animation elements spanning the 60s, 70s, and 80s to create the essence of childhood fantasy, and entertainingly intertwines them with the photo realism of today's animation. As the self-described Boss Baby of his family, McGrath (Madagascar; Megamind) has offered this film as a love/apology letter. Indeed, the film highlights sibling rivalry and jealousy; but it also captures the bonding and love that is born of the outlandish imagined scenarios of children. For Tim and his young brother, it is the epic battle that will decide whether puppies or babies are most lovable and desirable. Their parents (voiced by Jimmy Kimmel, Jimmy Kimmel Live! ; and Lisa Kudrow; Friends, The Comeback), work for Puppy Co., and the villainous Francis E. Francis (voiced by Steve Buscemi; Boardwalk Empire, The Sopranos) who is behind the epically evil plan. Once they realize that the entire world balance is at stake along with their existence as they know it, (drumroll) they unite forces. Siblings traversing the wild dangers of the world together; looking out for each other. The soundtrack, which includes original music as well as some familiar favorites (love, love, love Blackbird, and it plays prominently!) complements the visual interplay of animation styles. In addition to having found the right voices to bring these characters to life, the entire Boss Baby production team is led by a core of talented and accomplished individuals which includes: producer Ramsey Naito (Barnyard; South Park); writer Michael McCullers (Saturday Night Live; Austin Powers); editor James Ryan (Madagascar; The Prince of Egypt); production designer David James (Mr. Peabody & Sherman; Megamind); head of story Ennio Torresan (Kung Fu Panda; Bee Movie); and Director of Previsualization Kent Seki (Mr. Peabody & Sherman; Iron Man). There is a follow-up to the original book. A sequel, I suppose. The Bossier Baby. It will be fun to see where (even, if) a new CEO in the family might take us. I know I have a few ideas of my own; don't tell me you don't. For now, take the family to watch a fun, relatable flick together. There will be plenty on which to reflect. I watched a couple months ago! It is a great movie ! !